Every time I leave my house I check for four things — my keys, cell phone wallet and chapstick. I will not go on my way until I pat down my pockets and confirm I have all four. I can’t remember when this started, but it became a habit of mine and now I do it without thinking. It is so burned into my brain that I would probably forget to wear underwear before I forgot chapstick. I need to amend the above statement. I don’t leave the house without my keys, cell phone, wallet and lip balm. I rarely have the actual brand Chapstick, but that doesn’t stop me from referring to my lip balm as such. This is what is called a generic trademark. This is when a brand name takes over a generic name due to popularity. Just like how a Band-Aid is actually an adhesive bandage. I bet you may not even know you do this for many brands. Want to find out? Here’s a fun list of generic trademarks. I used to have a chapstick (or lip balm) problem. I figured that if a little was good, a lot was better so I would cake the stuff on. My lips were so greasy, that it looked like I had just been smooching a stick of butter. After awhile I learned that with so much chapstick on, butter was the only think I would have a change of kissing, so I dialed it way back. There are hundreds of versions of lip balm. You can choose based on brands, packaging, flavors, strengths and price. There are very few things where one size fits all. When doing research for this post I learned that chapstick played a role in the Watergate scandal. 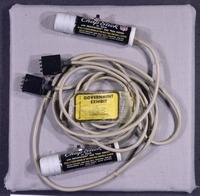 Apparently the chapstick contained hidden microphones used by E. Howard Hunt and G. Gordon Liddy, the leaders of the Watergate break-in team. Here’s a picture of them.